Complete your bedroom rendition with the handmade Quick Ship Amish Berkley Five Drawer Chest. This solid wood chest of drawers is available as shown in brown maple and elm wood. Crafted using traditional Amish construction methods, this heirloom quality chest of drawers will be built to last. All five drawers are assembled using dovetailed joinery and are affixed on full extension ball bearing side mount drawer slides. Made in America by expert Amish woodworkers, this handmade chest of drawers is one to cherish. This wonderful chest has a lead time of only 2-3 weeks, ensuring that you will get it in no time! 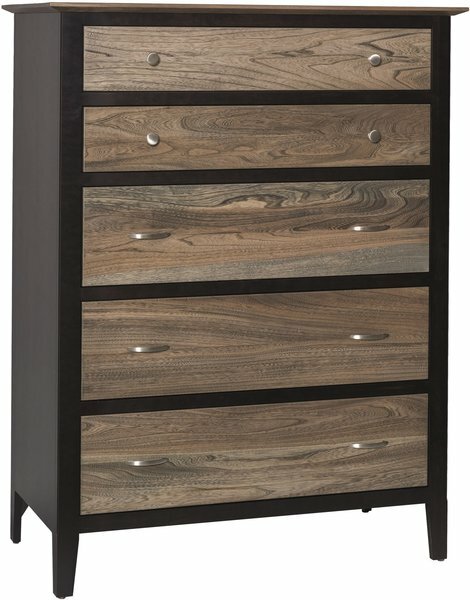 Get this coveted chest today and enjoy ample storage in your bedroom for many years! Call today at 866-272-6773 for assistance placing your order or answers to your questions through one of our dedicated furniture specialists. Thank you for choosing DutchCrafters for all of your bedroom furniture needs.